By Steven VanCauwenbergh, author of The Savvy Landlord! 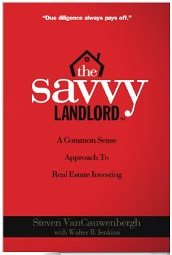 This combo offer includes the second book from the Savvy Landlord to give you more insight in the wild ride of real estate investing. His first book, The Savvy Landlord, was one of our best-selling books of the Summer. Real estate investing can be difficult at times when you have to deal with the unexpected circumstances regarding residents, contractors, and costly repairs. 301 Questions & Answers offers you simple, straightforward solutions that can save you time and money in the operation of your business. Written in a quick, easy, and accessible style, this comprehensive handbook guides you through all areas of investing in real estate. 301 Questions & Answers simplifies key terms you need to know and provides answers to solve questions most asked by real estate investors and landlords. It also gives specific tips for the non-technical investor in all of us. * What is a double-closing? * How do I convince my tenants I am not a millionaire? * What is an assignable contract? * How do I reduce my closing costs? * Can I really buy a house with no money down? * How can I tell if damage is normal wear and tear? * What do I do when a tenant offers to pay for the rent with personal favors? * What is quitclaim deed? * Should I carry a gun to collect rent? * What is an REO? ...and 290 more questions with answers! This combo offer also includes the audio version of this book on an MP3 format, audio CD set (Running Time: Approx. 4 Hours -- Unabridged). You can own 301 Questions & Answers and the Audio CD set now for only $34.95 with FREE shipping (Regular price is $44.95)!